Two posts in two days!?! I think this just shows how enthusiastic I am about the Summer Day Top by Made Everyday. My first version in gingham is summer perfection, but this linen blend stripe with embroidery is my favorite thing to wear. The only trick with the border embroidery was making sure I cut the back first to leave adequate room for the lower hem. Then, I aligned the front pattern piece and marked the location of the border to make sure it would match when I stitched up the sides. I scored this fabric when the linen blends were on sale at Joann Fabrics. If you love a good deal like I do, you will appreciate that it was regularily $20 per yard on sale for $7.99. Plus, I had a 20% off coupon. This was my first time sewing with a linen blend, and I am a huge fan. I went back to Joann's to buy another print very soon after. I find so much linen inspiration from Knee Socks and Goldilocks. I lengthened this top just a smidge more than my first and I think I prefer a little extra length with the additional drape. 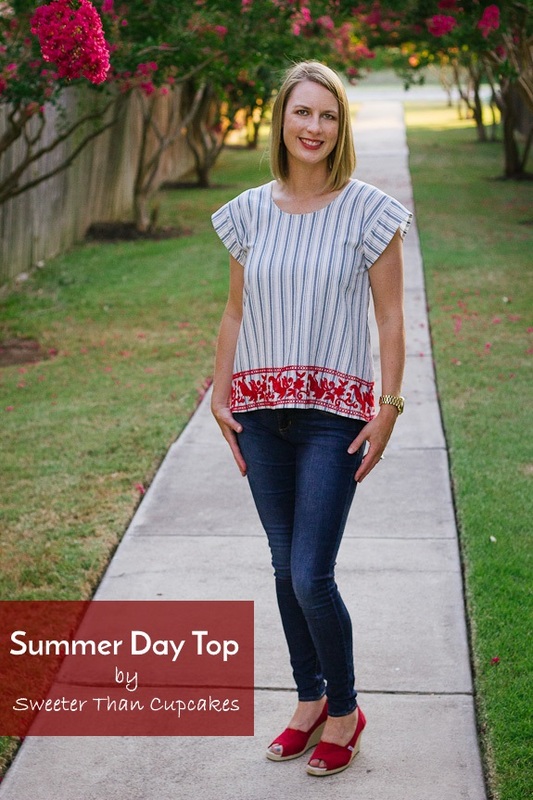 Today is the last day of the introductory sale for the Summer Day Top. I think everyone's wardrobe could use one or two! It's adorable! I'll have to give it a try! Inconceivable post as anyone might expect. Survey from the sidelines each one of these years, your composed work totally gave me encounters into the trip that has passed on you to this particularly earned, fulfillingness first finale. Congratulations. Your blog held my preference perfect to the specific end, which isn't for the most part a straightforward movement!! A commitment of gratefulness is all together for the ordinary blog. From the tremendous measures of comments on your articles, I think I am the just a single having all the entertainment here!